The Art of Making Blog: This is awkward. I spent the week furiously making a Christmas gift, but I can’t write about it yet in case the recipient happens to read this blog. I will say this: My husband liked it so much that he was trying to convince me to keep it for myself. I held firm; it’s wrapped and on its way to the intended recipient. I promise to write about that project in a future post. Now what? Well, to backtrack a bit, some family came to visit with us during the week of Thanksgiving. Before my aunt’s arrival, she mentioned that she’s going to start a quilt — I believe it’s her first — and she wanted my input to help her choose colors to coordinate with her existing room colors. There’s a local sewing store nearby that hosts the area quilt guild meetings. I haven’t made it to a meeting yet, but thought the store might be a good place to start. I knew they sold sewing machines, and was pretty sure they sold fabric as well. If not, they would know where to send us. Sure enough, they sell two brands of sewing machines plus an assortment of quilting fabric and supplies. I think I even saw some vacuum cleaners. I’m extra excited to have found this store since I’ve already determined that there aren’t any local yarn stores. Ordering supplies online is convenient, but when it comes to fabric and yarn it’s so much nicer to shop in person; I like to touch the fiber and really see the colors. I picked up a yard (almost a meter) of the piggy fabric on the left. It’s from the Harmony Farm line by Shawn Wallace for Riley Blake Designs in the color Harmony Hog Wash Brown. The playful little pigs make me smile. 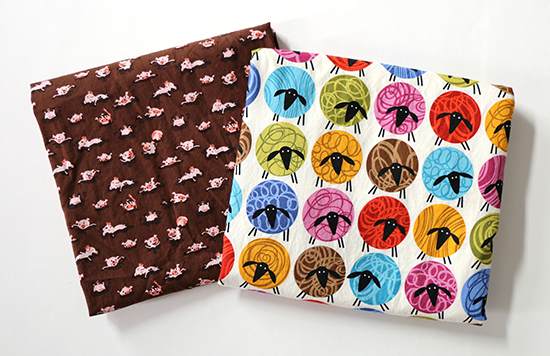 I also bought three yards (about 2.75 meters) of the sheep fabric on the right. The line is All’s Wool That Ends Wool by Maria Kalinowski for Kanvas in association with Benartex, LLC, in the color Sheep Thrills Cream/Multi. Each round wooly body is about 2 1/4 inches (5.7 cm) in diameter, so this will either end up as a statement fabric cut into large blocks or as a quilt backing. I haven’t quilted in a long time, and these fabrics make me want to get back to it. But not yet. We have holidays to celebrate first! I wish you and yours a wonderful holiday season.